Genuine faith accepts correction and walks in holiness and harmony. In part 12 of 2 Corinthians: Overcoming Affliction With Christ’s Love and Truth, Pastor Dan Cox reads from 2 Corinthians 12:11 – 13:14. God’s power is revealed in our weakness, and through our weakness, we are strong in Christ. In part 11 of 2 Corinthians: Overcoming Affliction With Christ’s Love and Truth, Pastor Dan Cox reads from 2 Corinthians 11:1 – 12:10. Generous, cheerful giving honors God and blesses the believer to be a blessing to others. In part 10 of 2 Corinthians: Overcoming Affliction With Christ’s Love and Truth, Pastor Dan Cox reads from 2 Corinthians 8:1 – 9:15. Godly grief over sin produces a repentance that leads to salvation, but worldly grief produces only spiritual death. 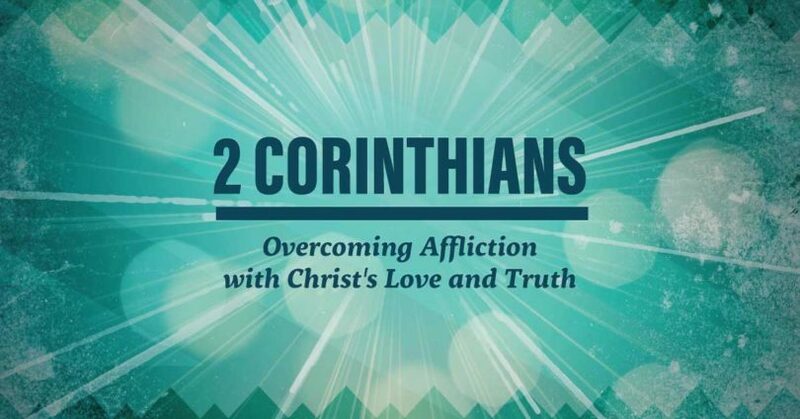 In part 9 of 2 Corinthians: Overcoming Affliction With Christ’s Love and Truth, Pastor Dan Cox reads from 2 Corinthians 7:2-16. Followers of Christ are a holy temple of God called to bring holiness to completion in the fear of God. In part 8 of 2 Corinthians: Overcoming Affliction With Christ’s Love and Truth, Pastor Dan Cox reads from 2 Corinthians 6:14 – 7:1. Followers of Christ are new creations- ambassadors of reconciliation called to proclaim that now is the day of salvation. In part 7 of 2 Corinthians: Overcoming Affliction With Christ’s Love and Truth, Pastor Dan Cox reads from 2 Corinthians 5:11 – 6:11. Since the Holy Spirit is our guarantee that God will soon give us glorious eternal resurrection bodies, we can be encouraged today and make it our aim to please the Lord now in every way. In part 6 of 2 Corinthians: Overcoming Affliction With Christ’s Love and Truth, Pastor Dan Cox reads from 2 Corinthians 5:1-10. We carry the treasure of Christ in frail, mortal bodies, but we must not lose heart because this light momentary affliction is preparing for us an eternal weight of glory. In part 5 of 2 Corinthians: Overcoming Affliction With Christ’s Love and Truth, Pastor Dan Cox reads from 2 Corinthians 4:7-18. Followers of Christ are ministers of a new covenant of the life-giving Spirit and are being transformed from one degree of glory to another. In part 4 of 2 Corinthians: Overcoming Affliction With Christ’s Love and Truth, Pastor Dan Cox reads from 2 Corinthians 2:12 – 4:6. Forgiveness is a vital step toward emotional and spiritual healing- a step the enemy is eager for us to skip. In part 3 of 2 Corinthians: Overcoming Affliction With Christ’s Love and Truth, Pastor Dan Cox reads from 2 Corinthians 2:5-11.